The five-star MS George Eliot – named after one of the leading English novelists of the 19th century – is 110 metres of fine Swiss engineering and craftsmanship. As with all Riviera Travel cruise ships, MS George Eliot was built to the highest specifications and strict safety regulations by Scylla AG, world-renowned builders of the most modern cruisers in Europe. Guests are welcomed in the elegant lobby with its gleaming marble floor, well-lit by sophisticated lighting. 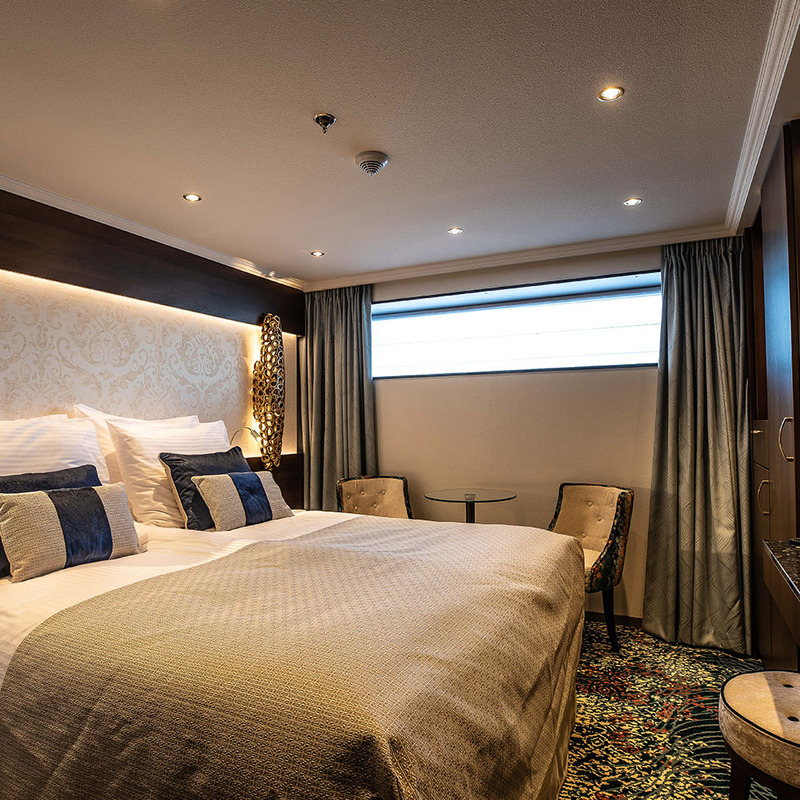 Thoughtful design is on tasteful display throughout the ship – sustainable hardwood furniture, intricate wrought-iron work, and polished copper and brass are beautifully complemented by soft leather and sumptuous Italian fabrics. MS George Eliot offers the convivial ambience and personal service of a luxury boutique hotel. With 36 staff serving just 132 guests, the experience is far more intimate and enjoyable. There are 70 luxuriously appointed suites and cabins, which all feature an en-suite bathroom with shower, individually controlled air-conditioning, flat-screen TV, hairdryer, safe, minibar, telephone and facilities for making tea and coffee. Complimentary Wi-Fi is available throughout the ship. For information about life on board our European river cruise ships, click here. 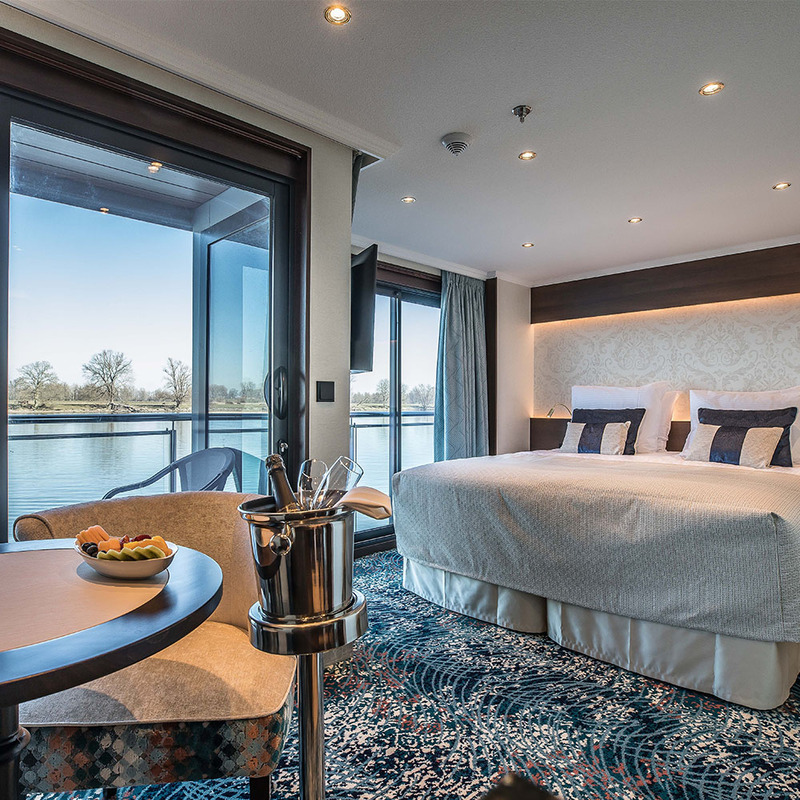 For the ultimate in space and river cruise luxury, the spacious Deluxe Balcony Suite offers a generous living area with chairs and table, plus soft cotton bathrobes and slippers. There are floor-to-ceiling windows and sliding glass doors that open out on to a small balcony with a table for two. There are four Deluxe Balcony Suites on the Diamond Deck (upper deck). Superior Suites on the Diamond Deck benefit from a generous living area, plus floor-to-ceiling sliding glass doors that open up to create a French balcony for guests to enjoy panoramic river views. There are two Superior Suites on the Diamond Deck (upper deck). Standard Cabins on the Diamond Deck feature floor-to-ceiling glass doors that slide away to create a French balcony to enjoy panoramic river views. There are 22 Standard Cabins on the Diamond Deck (upper deck). Superior Suites on the Ruby Deck benefit from a generous living area, plus floor-to-ceiling sliding glass doors that open up to create a French balcony for guests to enjoy panoramic river views. There are two Superior Suites the Ruby Deck (middle deck). Standard Cabins on the Ruby Deck feature floor-to-ceiling glass doors that slide away to create a French balcony to enjoy panoramic river views. There are 28 Standard Cabins on the Ruby Deck (middle deck). 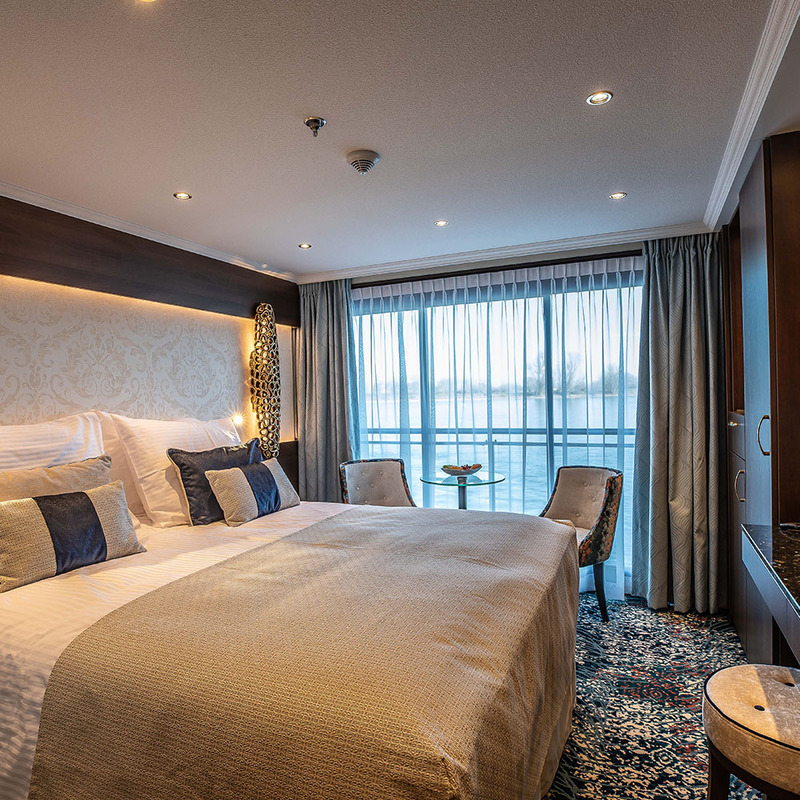 Superior Suites on the Emerald Deck benefit from a generous living area and smaller fixed windows. There are two Superior Suites the Emerald Deck (lower deck). 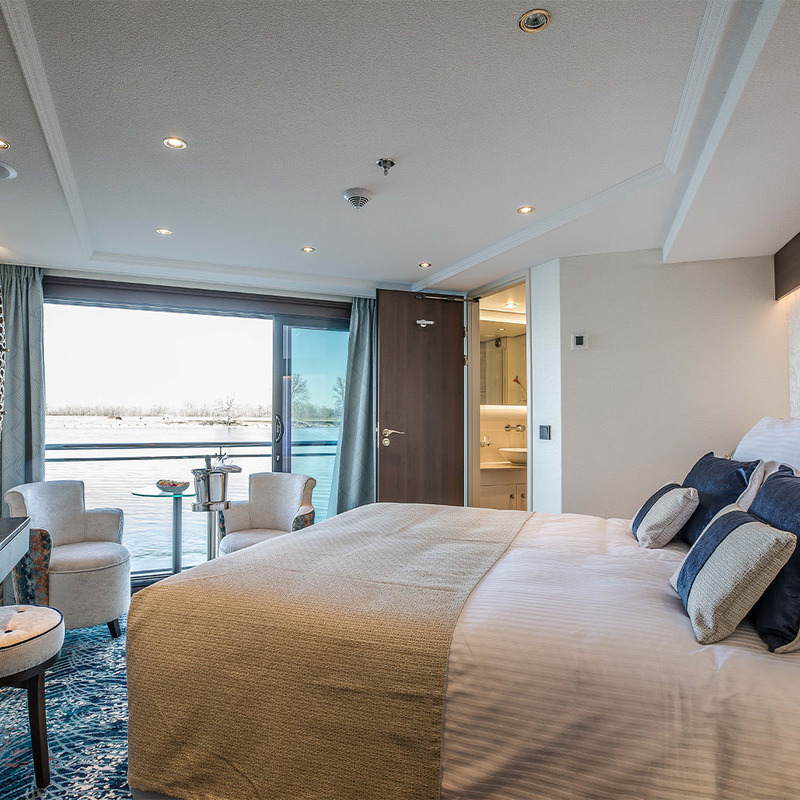 Standard Cabins on the Emerald Deck have smaller fixed windows – some are available for sole occupancy with no supplement. There are 10 Standard Cabins on the Emerald Deck (lower deck). Crowning MS George Eliot is the sun deck, the ideal spot for taking in unhindered river views. There is a shaded seating area with plenty of comfortable outdoor chairs and sun loungers, as well as deck games such as giant chess. Cool off in the splash pool and enjoy a full bar service. The lobby, observation lounge and bar, bistro and boutique are located on the Diamond Deck. 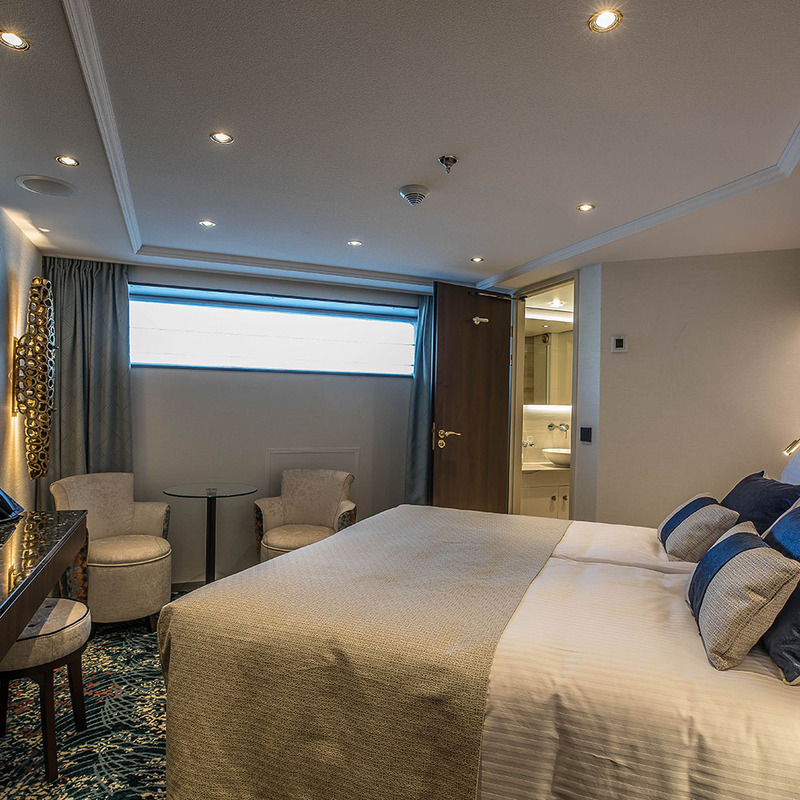 At the heart of the ship is the elegant panoramic observation lounge, where guests can enjoy marvellous views through the floor-to-ceiling windows. Take a seat on a leather armchair or modern settee, while the charming bar staff prepares your drink. During the evenings, the ship pianist entertains with a relaxing repertoire. Perhaps escape to the bistro at the rear of the ship and enjoy a quiet read on the terrace. 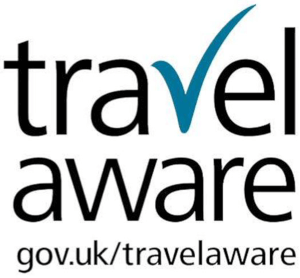 Should you have any queries, stop by the reception desk in the lobby, or let a crew member at the travel desk help you with your travel arrangements. The spacious main restaurant offers an intimate yet relaxed fine dining experience with informal free seating. Guests are spoilt for choice with a hearty range of buffets at breakfast and lunch, and sumptuous four-course dinners executed with silver service. Book an appointment at the hairdresser’s, which offers manicures and pedicures for a small additional fee. A lift connects the Diamond, Ruby and Emerald Decks, while the Sun Deck is accessed by staircase.